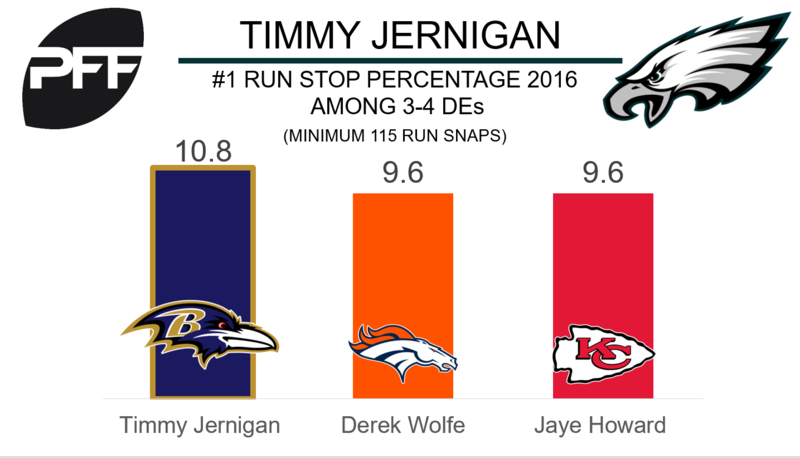 Philadelphia Eagles interior defender Timmy Jernigan was named as one of the ten most overlooked additions of the offseason by Bleacher Report. The Eagles acquired Jernigan via trade with the Baltimore Ravens in exchange for the 74th overall pick in the third round of the 2017 NFL draft. Last season Jernigan had a run stop percentage of 10.8, which was the highest run stop percentage of any 3-4 defensive end (minimum 115 run snaps). He piled up 20 stops on 185 run snaps and only missed one tackle. A stop is anything which constitutes a “loss” for the offense. Jernigan graded as the 42nd best interior defender last season with an overall PFF grade of 75.1. Over his three year career, Jernigan’s overall grades have decreased each year going from 80.8 as a rookie to 76.8 in 2015 to 75.1 last year.